I backup my iphone 6 and when I conntected my new XS and wanted to restore the data from the old one I got a pop up message saying that I should enter an encrypted password. I did enter my passcode (which is the same in both phones) I also tried my Apple ID password and I still get this error message "itunes could not restore the iphone because the password was incorrect". Please help. Many users would like to encrypt their iTunes backup to protect their privacy. It is all right and highly recommend but it will cause trouble when iTunes asks you to enter the password to unlock your iPhone backup but you have no idea about what the password is. Worse still, apple didn't offer any way for you to recover iTunes backup. Here are 3 easy methods which have already been proved workable to fix the issue of iTunes could not restore iPhone because the password was incorrect. It's quite likely that you might set your iPhone backup password the same as other passwords which you should try and see if it's the forgotten iPhone backup password. If the above passwords failed to unlock iPhone backup for you and you've no idea what to do, a professional tool iPhone Backup Unlocker - Tenorshare 4uKey - iTunes Backup is recommend to you. This program can easily find the password to unlock iPhone backup as well as remove iTunes backup encryption if you don't need the encryption feature any more. Step 1. 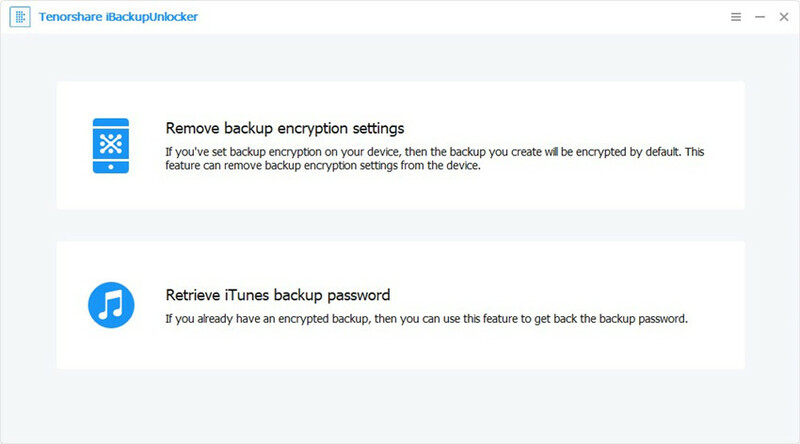 Download and install iBackUnlocker on your computer, and then select "Retrieve iTunes backup password" from the main interface. Step 2. All iTunes backups on this computer will be listed on the main interface. Select the file you want to decrypt and click on the Next button. Step 3. Select your perferred attack mode from Brute-force Attack, Brute-force with Mask Attack and Dictionary Attack. Step 4. Click "Start" to start to find password. Within a while, the password is displayed in a smaller window. Now connect the device with PC and launch iTunes. Now, you can create a new backup of the iDevice again but make sure not to check the "Encrypt Local Backup" option if you don't need to encrypt your iTunes backup. That's all for how to fix iTunes could not restore the iPhone because the password was incorrect. Hope you can find out your correct iPhone backup password with 4uKey - iTunes Backup. And you can also select to backup and restore your iPhone with third-party software like iCareFone, which would offer you more flexiable options in backing up and restoring iOS device.